Snoree, innocent by-snorer, passive snorer. There are many names, but to you, it really it doesn’t matter what you’re called when all you want is a bit of peace. If you’re losing sleep because of your partner’s snoring, there are some things you can do to help yourself and help them. Here, we look at the significance of sleeping with a snorer and explore the ways you can stop the snoring or at least cope better! You probably don’t need to be told that sleeping with a snorer has massive implications for your sleep quality. Having disturbed sleep isn’t pleasant and isn’t very healthy. The mental impairment from moderate sleep deprivation equates to the effects of mild alcohol intoxication. When you consider that sleep deprivation is closely linked to weight gain, and that weight gain facilitates snoring, one could even speculate that snoring is in-fact contagious! Living with snoring doesn’t just mean disrupted sleep but can entail a disrupted relationship too. Conflicts can easily arise as a result of snoring, conjuring feelings of guilt and resentment, doing damage to your emotional and physical intimacy. Some sources even cite snoring as the third leading cause of divorce in some countries . One study in Australia reported that snoring was the sole cause of marriage breakdown in 50 of 300 women surveyed . Make sure your partner knows that their snoring is a problem for you. If they are to stop snoring, they’re going to have to make some changes, but won’t do so if they don’t think their snoring is an issue. There are a number of lifestyle changes that can be adopted to help reduce snoring naturally. Engaging in these together can have benefits not only for the snoring, but for your relationship too. If body weight is playing a part in your partner’s snoring, get involved in those things that can help them to lose weight. Show some solidarity with them by eating healthily, planning and cooking meals together, and by doing exercise you both enjoy. Mouth exercises are another great way to tackle snoring for many people. It can sometimes feel a bit strange and silly doing them on your own, so why not make it more entertaining by doing them together? Sleeping position is often factor in people’s snoring, as supine sleeping (on the back) massively increases the risk of snoring. “Poke, nudge and roll” is a useful tactic in the short term, but soon enough, if it’s your partners preferred position, they will end up sleeping on their back again. And so the process repeats. There are devices available for snorers to wear which look like a backpack to stop them rolling onto their backs, as well as some pillows to help keep them on their side. Alternatively, you can instead address your shared sleeping position. Try sleeping back-to-back, propping each other onto your sides so that your partner can’t roll onto their back. Two heads are better than one. Sometimes, the cause of snoring isn’t obvious and requires more investigation. 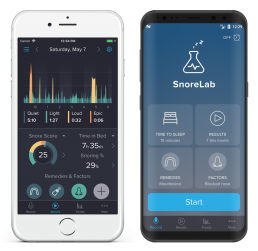 With a fresh perspective as the snoree, you can help your partner to identify the cause of their snoring and find the things that really work. Have you noticed a recent change in your partner’s snoring? Has this coincided with any behaviour or health changes? As the non-snorer, you are in the unique position of being able to see and hear the differences that the snorer may be oblivious to. If you take a while to fall asleep, head to bed slightly earlier than your partner. Given that a snorer doesn’t wake themselves when they snore, then why should they wake you if you’re already fast asleep? Unfortunately, this tactic is unlikely to work every time. The cyclical nature of sleep means you are still likely to catch the snoring sound during one of your lighter sleep phases. Nonetheless, it should at least prevent the “as soon as his head hits the pillow, he’s snoring” complaint. This is a solution that many couples cite as the saviour of their marriage. You’ll frequently hear accounts from couples who have slept separately for years due to someone’s snoring. Whilst this solution is great for your health through banishing the snoring sound and getting some sleep, co-sleeping is still important for the health of a relationship. In his book “Two in Bed: the Social System of Couple Bed Sharing”, sleep researcher Paul Rosenblatt examined how sharing a bed is important for couples. He described the importance of bed sharing for intimacy and comfort, as well as pre-sleep being a time that couples use to catch up, plan, make decisions and solve problems . That said, and as many snoring couples will tell you, sleeping separately doesn’t necessarily mean the end of these benefits. Set aside that same time to enjoy each other’s company, before eventually doing the sleeping part in separate rooms. Basic but effective, a good set of earplugs specifically designed for sleep can be indispensable for the partner of a snorer. A simple multipack of foam earplugs will do the trick, but also shop around for ones that are sleep-specific: soft and comfortable when laid upon, and with properties that allow you to still hear your alarm in the morning. Introducing more sound to a room plagued with snoring seems counter-intuitive, but there is some sense in using white noise to mask snoring. White noise is a sound that contains all audible frequencies at the same intensity – similar to the notion of white light. This doesn’t block the snoring sound, but instead masks it as the snoring frequencies blend in with the frequencies coming from the white noise machine. By playing this consistent sound before sleep, you are less likely to notice sudden changes to the sound profile of your room throughout the night. In short, if you can’t stop the snoring, learn to cope with it. This quote comes from Jon Kabat Zinn, a medical professor who teaches mindfulness. The mindfulness approach puts the onus on the snoree and is about changing the way you perceive your partner’s snoring. Try to emotionally detach from the snoring sound and instead treat it like your own personal soundscape. There have been many accounts from frustrated partners who, instead of letting the snoring sounds irritate them, used it as a source of meditation and mindfulness. They objectively listened to the sounds, accepted them and lost no sleep as a result. Rosenblatt PC. Two in Bed: the Social System of Couple Bed Sharing. State University of New York Press: Albany, NY, 2006.